September 8, 2015 by Lynette M. Fraga, Ph.D.
I’m writing this as I ride the train from New York City headed back to Washington, D.C. on the last day of summer. Tomorrow the kids will return back to school in Virginia, and I am certain that there will be anticipation and perhaps a bit of (unadmitted) anxiety for what’s to come in the school year ahead. But before I too begin to think about the launch of the year ahead, I must share about our last weeks of summer! This month we launched the Healthy Child Care, Healthy Communities project funded by the Robert Wood Johnson Foundation to expand technical assistance activities in targeted states to emphasize health, nutrition, and obesity prevention. You can find out more about the project and apply on the CCAoA website. The project will be managed by Krista Scott, Sr. Director of Health Policy. Krista has her bachelor’s degree in political science and her M.S.W. with a focus on management and policy. Most recently, she served as the Early Intervention Monitor for District of Columbia’s Early Intervention Program, which provides services to infants and toddlers with disabilities and their families and as the District’s Lead for Preschool Special Education. She has over a decade of experience providing quality assurance reviews, developing policies and procedures for early childhood programs, overseeing program budgets, providing access to health care to children with special health care needs, providing case management, providing reflective supervision and performing legislative bill analysis. 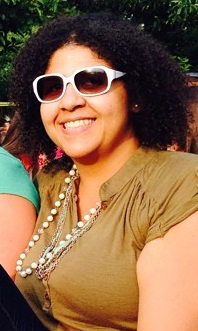 She holds expertise in group facilitation, reflective practice, early childhood mental health, early childhood education, early childhood special education, policy and procedure development, training, technical assistance, coaching, mentoring, systems and program development, quality assurance, and special education regulations. We are thrilled to have her join our team! We believe that all children are special and unique, which is why through our program we will work to find your child’s inner strengths and even unusual features and to nurture them – giving your child the best success. It is our goal to provide children with a safe environment that nurtures self-esteem and security. We provide a quality child care program in an academic and loving environment. Due to the extended period of time required to resolve county zoning and fire issues, it took Dilidaer 3 years and the support of her local CCR&R agency to achieve licensure for a home-based business. She holds a Ph.D. in economics from her home country of Xinjiang in China, and her standards-based curriculum will have a focus on nature and the arts. Congratulations, Aizezi Dilidaer! Earlier this month CCAoA participated in a joint Twitter chat with MomsRising to discuss the needs of parents. Together we reached over 128,000 accounts with 324 tweets and 51 contributors participating. You can find an archive of the chat on Twitter with the hashtag #WhatParentsWant. For many children and families August means back to school, which is why we joined ABC News in a Back to School Health Tips Twitter chat with Dr. Besser, ABC News Chief Health and Medical Editor. As a group, we sent over 3,523 Tweets which are available for review using the hashtag #abcDRBchat. 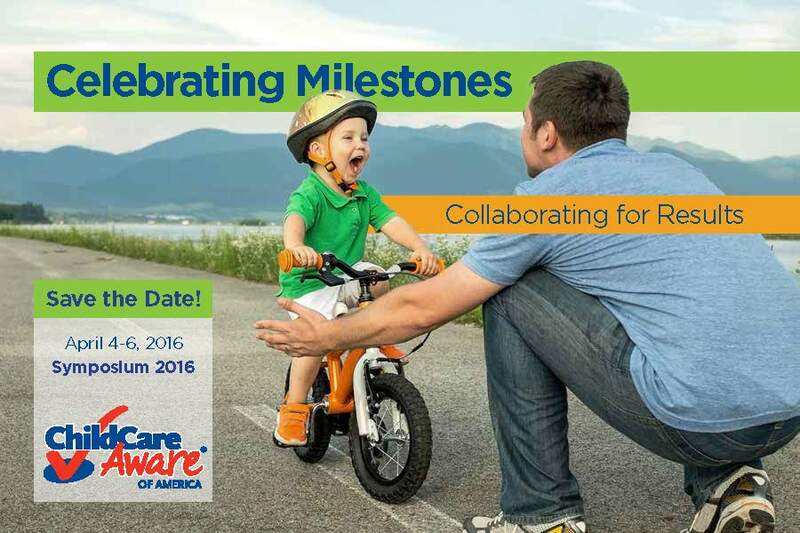 Child Care Aware® of America is pleased to announce the dates and location for the 2016 Symposium: Celebrating Milestones, Collaborating for Results. We hope to see you at the Omni Shoreham Hotel in Washington, D.C. April 4-6, 2016! Mark your calendars and be prepared to join in discussion on topics around policy, research, practice and innovation. On August 10, I appeared on the Fox 5 News morning show to discuss the cost of child care, especially in light of the recent poll commissioned by the Washington Post. Martin Austermuhle of NPR station WAMU interviewed Michelle McCready, deputy director of policy, on the cost of child care in Washington, D.C. Michelle weighs in on some of the aspects of the cost of living that are more expensive in the D.C. area, and how that contributes to the overall cost of care. it’s definitely a must-read: D.C. Is One of the Most Expensive Places in the U.S. For Child Care. But Why? April 16, 2014 by Lynette M. Fraga, Ph.D. This blog is republished from the Next Generation blog dated April 2. NOTE: The remarks below were delivered by Ann O’Leary on April 2, 2014 when she opened the 2014 Child Care Aware of America Symposium on early education policy, research, and practice. Thank you Lynette for inviting me here today and to the California Child Care Resource and Referral Network, led by Linda Asato, for encouraging me to join you. And thank you to Linda Smith for your leadership inside the government to make quality child care a priority. Lynette told you a bit about my professional background, but let me tell you how my professional background aided me in being a mother and a child care consumer. In 1997, just after the Child Care Development Block Grant was last updated, I started working on education, early learning and childcare policy in the Clinton Administration. It was such an exciting time because it was when we were learning about how rapidly the brain was growing in the first years of life and how much these early years really mattered. I personally learned at that time about the importance of talking to your baby from the earliest days and about how challenging it was for parents to get access to high-quality child care. Ten years later – in 2007 – I had my first child. And it was these professional credentials that had me calling up child care providers to get on the wait list just after telling my friends and family the news that I was expecting. I remember going to the National Education of Young Children (NAEYC’s) website to find which child care centers in my area were NAEYC certified. The former director of the infant/toddler program at my chosen preschool in Berkeley still tells the story of me showing up at her doorstep every day when I was nine+ months pregnant to find out if I’d be able to get off the wait list. She finally was so worried that I was showing up at her doorstep every day instead of getting some rest before the baby came, that she relented and gave me a spot. My daughter, now seven, was lucky to be able to attend the school for five years and my son, who is four years old, is still there. Everything about my experience is something I wish for all parents. To be able to search online for a quality child care center and really know that licensing or certification means something. It means that the center is safe, the child care providers are professionals who have real training to work with young children, and that together you’ll be able to work as a team to support your child’s development and early learning. But I also want families to benefit from some of the things that schools don’t offer, but that states should provide to families as child care consumers. States should do unannounced inspections so that they can find small and larger things for the school to correct—from ensuring that parents really do sign in and sign out our children, to ensuring that the school has appropriate safeguards on all the doors so that children can’t get out without an adult. Together, the school—with its amazing focus on child-centered learning and the scaffolding children need to develop in these early years—and the basic promises made to ensure that licensing means my child will be safe while my husband and I are at work, is what every parent deserves. Everyone needs and deserves minimum levels of safety and quality standards. And YOU are making sure that is happening. I applaud you wholeheartedly for what you have done to ensure passage of the Child Care Development Block Grant in the Senate and the work you are doing in the House to make these critical changes the law of the land. When we started Too Small to Fail, which is a joint initiative of Next Generation and the Bill, Hillary & Chelsea Clinton Foundation aimed at improving the health and wellbeing of our youngest children, we really looked hard at what we know about children today and what we knew about the investments needed to address the challenges faced by children. That more than a quarter of our children—which is a doubling from the early 1990s—now have a chronic health condition from asthma to autism to obesity. That despite important investments in poverty alleviation, we still have persistently high childhood poverty and poverty still remains that best indicator of a child’s educational success. But we were also incredibly motivated by what we saw as a tipping point moment in the early learning field. Because today, we know more than ever about the importance of early education. Brain scientists have documented what we have long intuited: talking, hugging, singing, and playing build critical hardware in a baby’s brain. Leading economists tell us that investments in the early years provide a tremendous return. The likelihood of a child achieving success in school and in the workforce is largely set before her first day of kindergarten. We have better and more sophisticated ways of reaching parents than every before thanks to technology and behavioral science. We were also very struck by the important new research coming from Harvard University Professor Robert Putnam. Dr. Putnam is studying today how economic pressures on parents translate into less time and support for kids who start off behind and struggle to catch up. In the 1960s and ‘70s, parents with different income and educational achievement levels were all spending similar amounts of time reading to their children, but over time, a gap emerged. Dr. Putnam and his team have looked at what they call “Diaper Time,” when parents address the immediate needs of their young children, and they’ve also looked at what they call “Good Night Moon Time,” when they talk, read, and interact with their kids. Now the research shows that nearly everyone does Diaper Time. But parents with lower income, less education, who struggle to work two jobs with few benefits or flexibility—many of them single moms, and parents without strong support networks—they are spending significantly less Good Night Moon Time each day than more affluent families and less than parents in comparable positions did 30 and 40 years ago. This lost time adds up. Studies have found that by a child’s fourth birthday, children in well-off families have heard 30 million more words than children from lower-income families. This disparity in hearing words from parents and caregivers translates directly into a disparity in learning words. In fact, on average, higher income four-year-olds know an average of 1100 words compared to just 500 words for lower-income children. This research has been replicated and strengthened in recent years by Professor Anne Fernald at Stanford University who has shown that not only is there a word gap, but that there is already a gap in language comprehension of six months by the time a child is two years old. And we know from another Stanford Professor – Sean Reardon – that this early gap in learning is the best predictor for the persistent educational achievement gap in the K-12 system. And that puts our children born with the fewest advantages even further behind. First, many low-income parents and caregivers are simply not aware of the importance of talking directly to their babies and toddlers to build their brains and prepare them for later learning and good health outcomes. Time and again, we have heard parents express surprise when told that by talking, reading, and singing to their babies from birth, they can actually build up their child’s vocabulary and help develop their brain. We have an enormous opportunity to empower parents and help them understand how their simple actions can have a large impact. Our goal is to help parents integrate talking, reading, and singing into their everyday routine with their children – just as they would brush their child’s teeth before bed. The campaign is focused on examples of simple actions – talking during bath time, telling a story while changing a diaper, singing in the car, playing peek-a-boo – that can help prepare children for academic success. This is why a strong partnership between families and child care providers is so critical. Parents look for information about their children’s well-being from family, friends, and trusted sources such as pediatricians and child care providers. We need your help to close this gap. We are partnering with local community organizations —engaging pediatricians, business leaders, librarians and others—to empower parents and caregivers to boost young children’s brain development and build their vocabularies by increasing the number of words they hear spoken to them every day. Only 55 percent of parents and 47 percent of grandparents report reading to their children every day. Fewer than half report telling their children a story, singing a song or playing a non-electronic game every day. Our “Talking is Teaching” campaign will show how simple actions—like describing objects seen on a bus ride, singing songs, or telling stories for just five minutes—can significantly improve a baby’s ability to learn new words and concepts. Creative messages will appear as ads on public buses, billboards, grocery carts and in places where Tulsa families congregate. Community partners will talk directly to parents and caregivers using family toolkits developed with Sesame Workshop; and to pediatricians using clinical toolkits on early literacy developed by the American Academy of Pediatrics (AAP). The campaign will also test new technology developed by the Bezos Family Foundation that will help parents remember to build these activities into their daily lives. We hope that our work in Tulsa will serve as a model for other communities across the country to motivate increased talking, reading and singing to babies and toddlers. And Too Small to Fail will launch additional campaigns in several more cities this year. In addition, we are working to magnify attention to the word gap through media partnerships with Univision and show integration with Hollywood. But we know that the second reason for the word gap, is that there is simply a lack of access to high-quality child care and preschool. With parents working, we simply cannot afford not to invest in high-quality child care that is available from infancy onward. Just the other day I was driving home after picking up my children and my son, who just turned four, started kicking the back of my seat and laughing and then he yelled “AVALANCHE.” And I asked him how he knew the word avalanche. He told me that he had heard it in a book his teacher read him at school. There has to be a continuum and a partnership between parental action and high quality child care and this takes real public investments. In 1971, the year I was born, President Richard Nixon famously declared that universal child care would have “family-weakening implications” as he wielded his veto pen to block a universal child care bill passed by Congress. We may look back on this moment with disbelief, but at the time – it really was a close call for America with real divisions about whether women should work outside the home. Those conversations may still occur among the elite, but nearly everyone else is working. Today, over 70 percent of families are headed by two working parents or a single working parent – compared to under 40 percent in the early 1970s. Unfortunately, President Nixon’s veto of universal child care became the last best chance for decades for the federal government to support working moms and dads trying to raise their children and earn a living at the same time. We are here because today is FINALLY our moment to make greater access to child care and early childhood education a reality. While we have made progress, it is clear that we need more of our leaders to fully embrace early learning as central to the future of our children and our economy. The Senate’s recent passage of the Child Care Development Block Grant bill is a great step in the right direction – and with such a strong, bipartisan vote! The President is using his bully pulpit to push for change. But it is up to us to make it happen. And it will truly take all of us. All Americans should have a deep appreciation of the importance of brain development of very young children – not just among advocates and researchers, but among grocery store managers, elementary school administrators, public transit operators, and governors. I believe that understanding will lead to more family interaction that supports children. It will lead to workplace changes that support families. And it will lead to federal policies that better support our child care providers. There must be a much greater support system to provide training and guidance to all who provide care and teach our youngest children, including parents. Throughout training, care givers should hear about the importance of talking, singing, hugging, and playing, as a critical component of brain development and life-long learning. The United States must distinguish itself as a country that values quality learning for young children, as evidenced by high quality child care centers. Parents, providers, and policymakers should develop a common, evidence-based definition of quality. Families should be able to enroll their young children in programs with confidence. And state- and federally-funded reimbursement rates should reward high quality programs. Low-income families should have the same range of choice as upper and middle-class families, so that their children can also receive the type of support that is best for them. To get there, we must start with a clear vision and set of convictions: our country can and should take a stand on early learning and development. Through thoughtful and collaborative work, we can continue a nationwide conversation about these issues. That is why it is so critical that you have all travelled here to DC to share your message with our legislators. But you must carry the message back home with you as well. Conversations about early development belong in every doctor’s office, place of worship, grocery store, and barbershop. Only when communities are reminded and convinced of the long-term gains made when we invest in young children will our politicians respond. So I hope you will join us in partnership at http://www.toosmall.org to work together on closing the word gap and creating an early learning nation. Ann O’Leary is vice president and director of the children and families program for Next Generation, which includes spearheading “Too Small to Fail”—Next Generation’s joint initiative with the Clinton Foundation to help parents and businesses take meaningful actions to improve the health and well-being of children ages zero to five. Recap all of the 2014 Symposium. 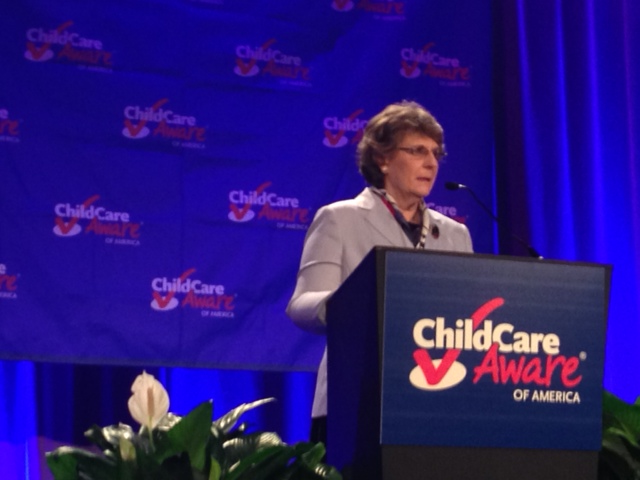 April 9, 2014 by Lynette M. Fraga, Ph.D.
Thursday began early when Senators Barbara Mikulski and Richard Burr were honored during breakfast with the Working for Working Families Award, kicking off day two of the Child Care Aware® of America 2014 Symposium. 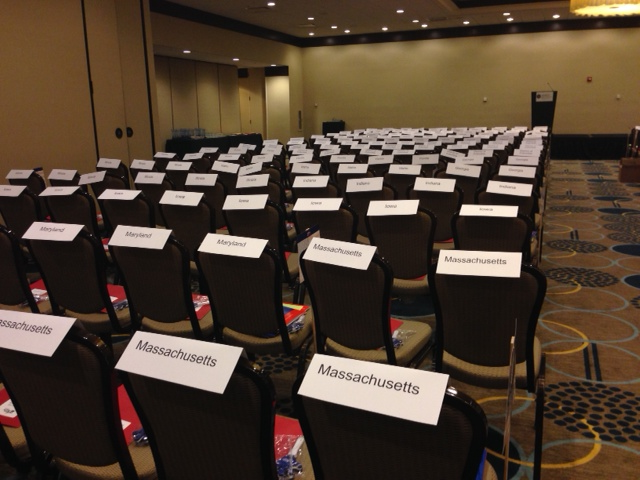 Attendees from all over the country met with their congressional members that afternoon. Starting with a celebratory photo, they returned to Symposium having made more than 347 visits with members of congress. “It was really exciting to go to the Hill and talk about why early childhood is so important and hear why they believed it was important as well,” said one attendee, Caroline, who came to Symposium from Florida. Those hill visits helped everyone move significantly closer to the 1K for Kids goal, bringing the total actions taken for children through social media over the first two days of Symposium to more than 800. By the end of Symposium, attendees and virtual participants had sent more than 1,500 social media actions, letters, visits and donations on behalf of children. That evening, during a reception filled with dinner and dessert, we honored Congressman George Miller (D-CA) and Senator Tom Harkin (D-IA) with Lifetime Achievement Awards for all of their work on behalf of children during their careers. 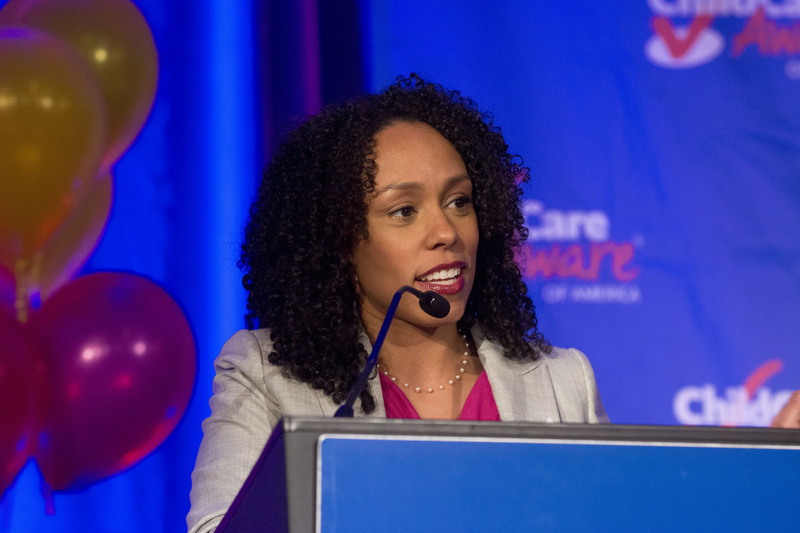 We couldn’t have picked a better closing keynote speaker than Dr. Myra Jones-Taylor, Executive Director for Connecticut’s Office of Early Childhood. She received a standing ovation for her talk about innovating for the future of children and families, and for supporting the value that we must make the child care system work for families. The annual meeting included a farewell from Michael Olenick. He concluded his term as board president of Child Care Aware® of America and handed the gavel to Dr. L. Carol Scott, CEO of Child Care Aware® of Missouri. Symposium ended with a special screening of the forthcoming documentary, The Raising of America. The film explores how a strong start for all children leads not only to better individual life course outcomes (learning, earning and physical and mental health) but also to a healthier, safer, better educated and more prosperous and equitable America. After the screening, Dr. Jones-Taylor joined a discussion panel that included Matthew Melmed, Executive Director of ZERO TO THREE; and Dr. Renee Boynton-Jarrett, Associate Professor of Pediatrics, Boston University School of Medicine, who also appeared in the film. 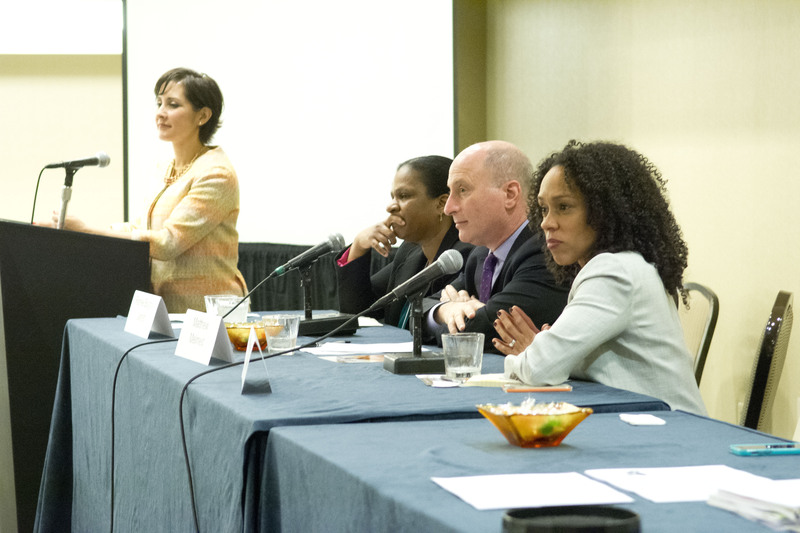 What was your favorite moment from the 2014 Symposium? We’d love to hear it in the comments below. Thank you to all our attendees, sponsors and presenter s who made the 2014 Symposium one of our best year’s ever. Stay tuned for more! April 3, 2014 by Lynette M. Fraga, Ph.D.
Linda K. Smith, Deputy Assistant Secretary and Inter-Departmental Liaison for Early Childhood Development for the Administration for Children and Families (ACF) in the U.S. Department of Health and Human Services(HHS), received the Sandra J. Skolnik Public Policy Leadership Award during the opening session for the Child Care Aware of America 2014 Symposium, Wed April 2. Linda’s acceptance speech brought the nearly 300 attendees to their feet as she praised the Child Care Resource and Referral Community for their hard work to help the country advance its child care policies, as evidenced by the Senate passing the Child Care and Development Block Grant (CCDBG) Reauthorization just weeks ago. 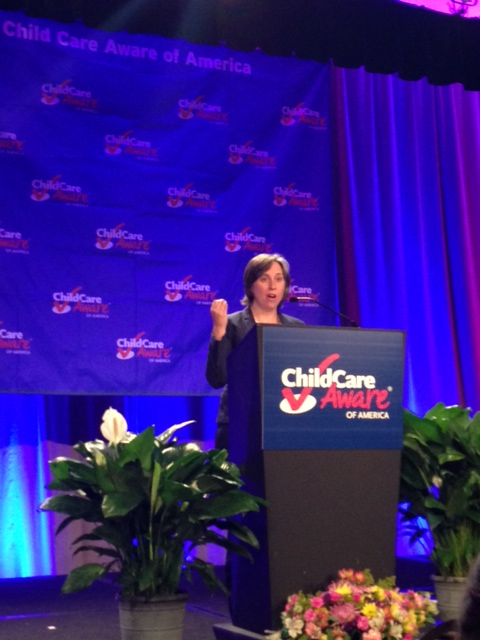 “The country understands the importance of quality child care,” Linda said. The day was filled with celebratory moments. From photos with the Walkaround Cookie Monster provided by Sesame Workshop to simply being in the nation’s capitol for the first time. Ann O’Leary, Vice President of Next Generation and Co-Director of Too Small to Fail, a joint initiative of the Next Generation and the Bill, Hillary and Chelsea Clinton Foundation, opened the event as the first keynote speaker. 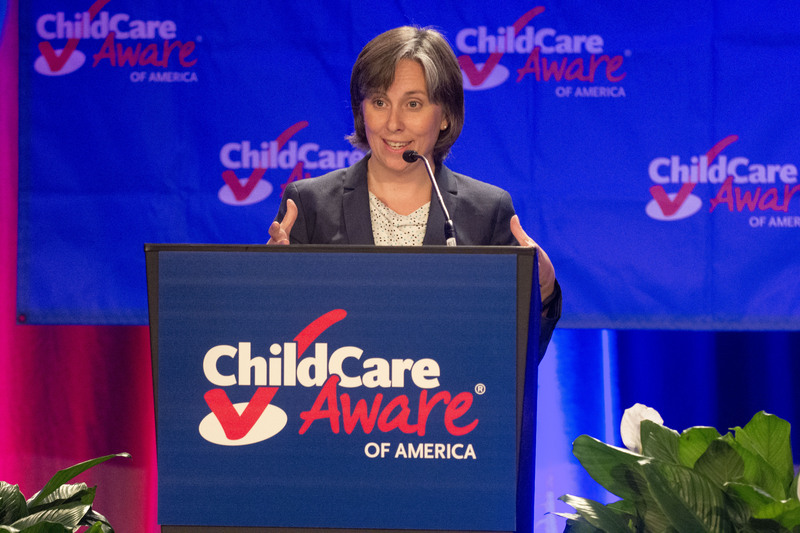 “Children can make terrific gains if they have access to high quality child care,” she said. With nine breakout sessions following the opening luncheon, attendees had lots of options. From Family Engagement to Early Head Start-Child Care Partnerships to Coaching Preschool Providers to success – every session was full. The day ended with a Federal policy update from Shannon Rudisill, Director of the Office of Child Care in the Administration for Children and Families under the U.S. Department of Health and Human Services and Steven Hicks, Senior Policy Advisor at the U.S. Department of Education in the Office of Elementary and Secondary Education. Many questions surrounded the Early Head Start- Child Care Parnterships. The panelists said they were encouraged that the program would help build relationship between EHS and child care advocates. Learn more about EHS-CC. A room packed full of representatives from states across the country gathered for the final meeting of the day to prepare for Day on the Hill. They prepared their talking points and picked up their Hill packets. But mostly, they were ready to thank Congress for supporting CCDBG and the many other positive policy actions taken throughout the past year on behalf of children and families. For those here in DC and at home, we’ve challenged eveveyone to make their voice heard for children. We’re asking everyone to help generate 1,000 actions for kids – or 1K for Kids – throughout Symposium. In just a few hours we were nearly a quarter of the way to our goal! You generated more than 220 tweets, facebook posts, likes, and shares with #RYH4ChildCare. But we have a long way to go. Learn how you can help grow our voice for children and get entered to win some fun prizes. Visit symposium.usa.childcareaware.org. Meanwhile, find your photo from Sesame Street’s Walkaround Cookie Monster photo booth! Post by Child Care Aware of America. April 1, 2014 by Lynette M. Fraga, Ph.D.
We are so pleased to collaborate with Sesame Workshop to distribute free resources through our membership from trusted characters children know and love! 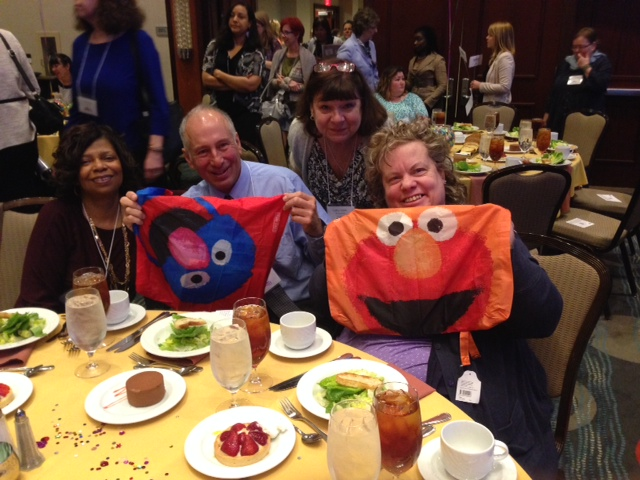 A big welcome to Sesame Workshop as part of Child Care Aware® of America’s official partner. ~ Lynette M. Fraga, Ph.D., Executive Director, Child Care Aware® of America. Thanks to Child Care Aware® of America, Sesame Workshop’s Little Children, Big Challenges resources will reach more parents and educators than ever before, to help children develop the resilience they need to overcome everyday challenges. From saying goodbye to a parent in the morning, being patient, overcoming bedtime blues, sibling rivalry, and even relocating, the lovable and relatable Sesame Street Muppets™ can show them how. Many people think that resilience is an innate part of a child’s personality, but by helping children cope with the challenges that come their way, children can actually learn the skills they need to build resilience, and in turn grow healthy and school ready. To help parents and children make everyday challenges into learning moments, Sesame Workshop has created bilingual (English/Spanish) multimedia resources including Sesame Street videos, print resources, and a guide for educators to use in the classroom. We want to do everything possible to make sure our resources are accessible to families when and where they need them. That’s why a dedicated partner like Child Care Aware® of America is such an important relationship to the Workshop. With their established network through the Child Care Resource and Referral (CCR&Rs) field, our multimedia materials about resilience will reach more than 860,000 families per year, and we can continue to develop and improve our resources using feedback from those families. This pilot program will allow CCR&Rs who are members of Child Care Aware® of America to submit requests for proposal to participate in the pilot, and distribute materials to children and families in their community. Updates around the rollout of materials and how to submit requests for proposal will be announced on this blog. For more than four decades, the Workshop has been focused on helping children achieve their highest potential. Today we continue our efforts, with the help of partners like Child Care Aware® of America, by tackling essential skills that can help children learn and grow as they encounter new challenges every day; they also provide the adults in their lives with tools to help young children build these crucial skills in a fun and furry way that only Sesame Street can – with the help of Grover and the rest of the Sesame Street Muppets. Sesame Workshop’s Little Children, Big Challenges initiative seeks to help children ages 2-5 in military, veteran and general public families build important resilience and perseverance skills that allow them to overcome challenges large and small. One of the most important factors in building these skills is the presence of a caring, supportive adult. This is why this new initiative is providing tools for adults to empower the children in their lives to transform everyday challenges into opportunities for growth, development, and lifelong success. Dr. Betancourt has directed Sesame Workshop Outreach projects in the areas of bilingual education, literacy, music, health and safety, resiliency, and child care. She has overseen content development for Sagwa, the Chinese Siamese Cat and advised on Dragon Tales. She is also the series content advisor for the award-winning parenting programs A Place of Our Own and Los Niños en su Casa. March 26, 2014 by Lynette M. Fraga, Ph.D.
1K for Kids: Participate in Symposium from home! This year at Symposium, we’re asking everyone to help continue the momentum for children in child care. You created a social stir during our Reddit AMA event and helped generate thousands of emails to push the reauthorization of the Child Care and Development Block Grant (CCDBG) through the Senate. Now, you can join us for Symposium wherever you are. We’re challenging everyone who cares about children to help generate 1,000 actions for children, or 1K for Kids. That’s easy. Each of these actions will help us reach the goal. Every action you take will count as one towards our 1,000 action goal. BUT, a donation will count as more. For example, if you donate $50 to Child Care Aware® of America, that counts as 50 actions for children. Share this Facebook post to help us generate 1,000 actions for children, or 1K for Kids. 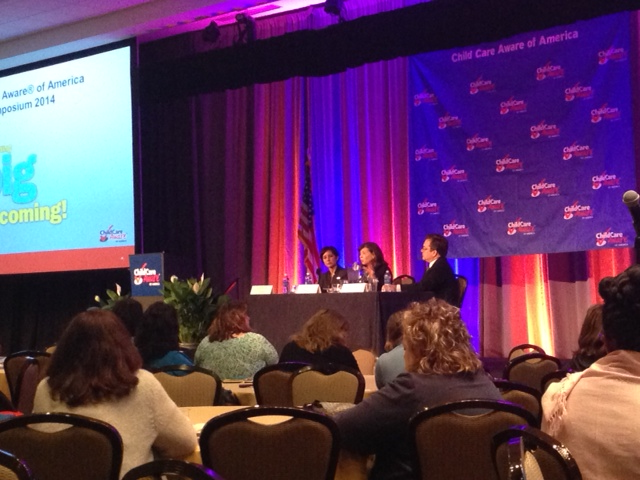 We’ll tally the actions with #RYH4ChildCare each day during the Child Care Aware® of America 2014 Symposium and share our progress. Every person who takes an action for children will be entered to win a prize. We’re giving one prize away each day. Visit http://symposium.usa.childcareaware.org/ 1K for Kids to learn more! Every day during symposium we’ll randomly pick a winner from the pool of people who help us reach 1K for Kids. Send a press release. That counts as an action! Check Facebook every day during Symposium to see the progress you’re making towards 1K for Kids. March 10, 2014 by Lynette M. Fraga, Ph.D.
March is Women’s History Month and in that spirit we’re proud to host an award that honors an incredible woman, Sandra “Sandy” J. Skolnik. Sandy Skolnik grew up with a working mother and knew the balancing act that required, though during her childhood having a mother working outside the home was the exception. 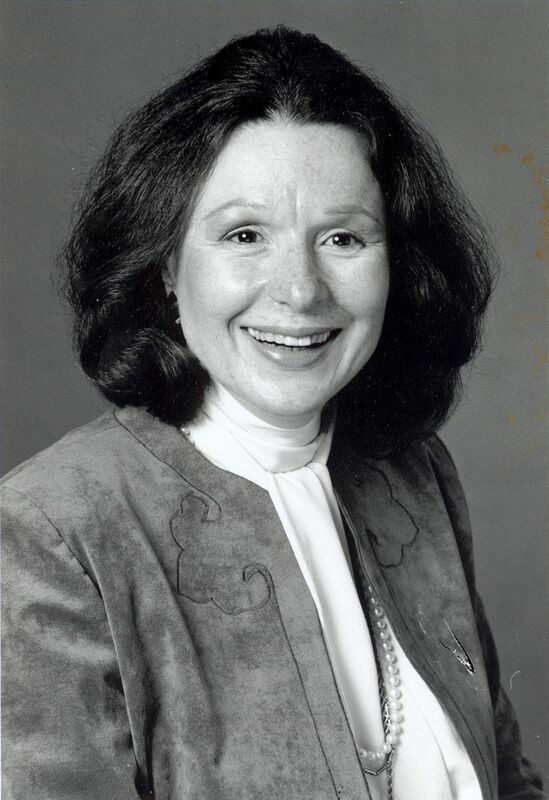 That perspective undoubtedly influenced her drive to pioneer the development of the Maryland Child Care Resource Network, a private-public partnership that continues to provide needed services for Maryland’s families with young children today. She also served as the Executive Director of the Maryland Committee for Children for over 30 years and was instrumental in growing the organization from a part-time staff of two, to a staff of over 75 committed to children and families. Above all, Sandy was a passionate visionary and a dedicated advocate for quality child care and education for young children. The recipient of numerous awards and honors during her life, we now honor Sandy’s legacy each year by granting an outstanding professional working on behalf of children and families within the Child Care Resource and Referral field, with The Sandra J. Skolnik Public Policy Leadership Award. 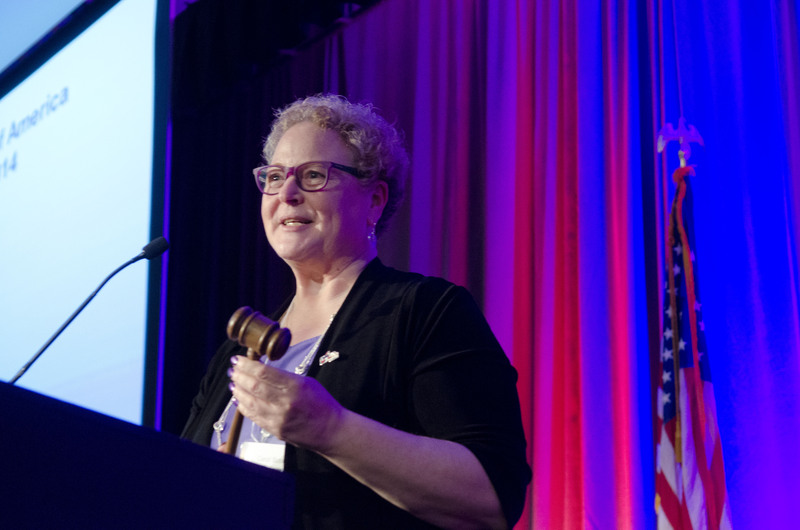 Established in 2008, past winners of the Sandra J. Skolnik award include its namesake Sandra J. Skolnik; Linda Foy, Childhood Development Service; Patty Siegel, California CCR&R Network; Clinton Macsherry, Maryland Family Network; and Elizabeth Bonbright, Child Care Aware® of Washington. Do you know a remarkable advocate for children and families? Please visit the Child Care Aware® of America 2014 Symposium page for instructions on how to nominate your colleague. The winner will be announced at symposium April 2-4. Act now! Nominations must be submitted by March 12.